It’s August 30th and this is the first dispatch for Berg Adventures 2006 Everest Expedition. I’m happy to say that this dispatch is coming to you from Lukla. At 7:10am today the team landed. That would myself, Wally Berg, Leila, Dave Hahn, Kit, Rob, Michael, Bryce and in this crew our special guest trekker Sean Moore. Jimmy Chin is still back in the USA, but he will be on his way to join us in a day or two. 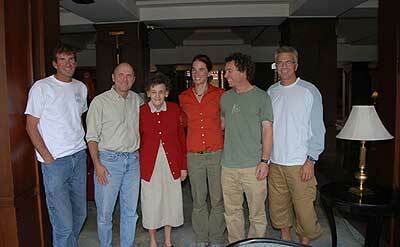 While in Kathmandu we met up with my old, dear friend Elizabeth Hawley. I have spent a couple of long and enjoyable sessions with her since I arrived here in Nepal which was great, she’s as sharp as ever and very relaxed and happy to learn about new adventures like ours. 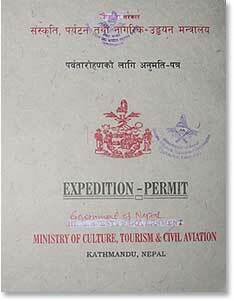 By the way the Ministry of Tourism told me that the permit they issued me was the first one from the new government, so it will be a special keepsake for this Berg Adventures 2006 Everest Expedition.